The Asian Civilisations Museum’s latest exhibition is a toothless interrogation of Sir Stamford Raffles, one of Southeast Asia’s most notorious colonizers. SINGAPORE — Three large billboards loom beside the gates of Singapore’s Raffles Place metro station, advertising the Asian Civilisations Museum’s latest special exhibition, Raffles in Southeast Asia: Revisiting the Scholar and Statesman. The billboards feature several taglines about the metro station’s namesake: “Plagiarist or pioneer? Leader or liar? Scholar or scoundrel?” The tone here is barbed, suggestive, inviting us to reconsider our understanding of Sir Thomas Stamford Raffles (1781–1826), a British colonial administrator now branded in history textbooks as the founder of Singapore and a national hero: a figure whose legacy includes an international healthcare conglomerate, the state’s most prestigious high school, and, yes, a subway station. 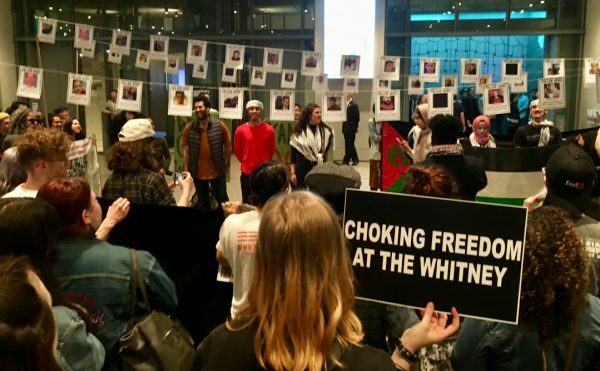 While the museum’s marketing team deserves kudos for getting the ball rolling in a long overdue public reconsideration of Raffles’ legacy, the exhibition unfortunately turns out to be entirely different from what is promised, lacking the bite and verve of its advertising campaign. Focusing predominantly on Raffles’ exploits in Java before his arrival in Singapore in 1818, the exhibition, co-curated by the British Museum, attempts to question the enduring myths surrounding a notorious figure responsible for some of 19th-century Southeast Asia’s greatest massacres. This sort of questioning is urgently needed in Singapore, but the exhibit fails to present enough material to adequately dismantle the official narrative on Raffles’ legacy — a narrative well-known for playing up the glories of colonialism while neighboring nations recover from historical trauma. There is simply too little to see here: too few artifacts to make up a spectacle, not enough historical context, not enough fire. 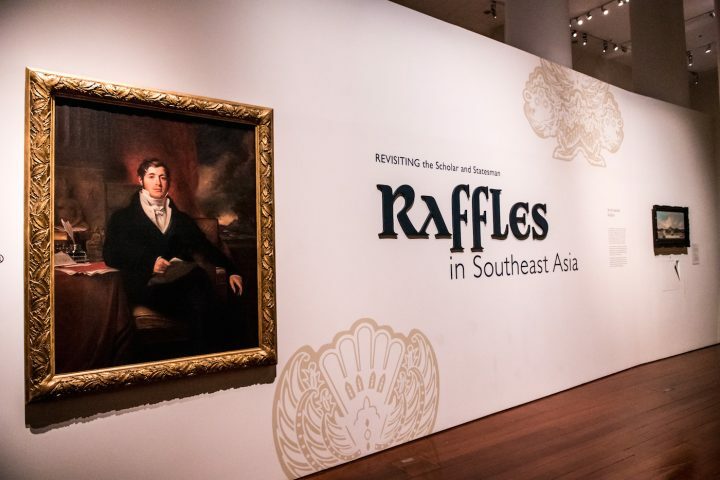 To read this exhibition and understand why its sparseness is so vexing, one first needs to understand who Raffles is, what he represents, and the trouble his legacy has afflicted on Singapore’s history for the better part of two centuries. 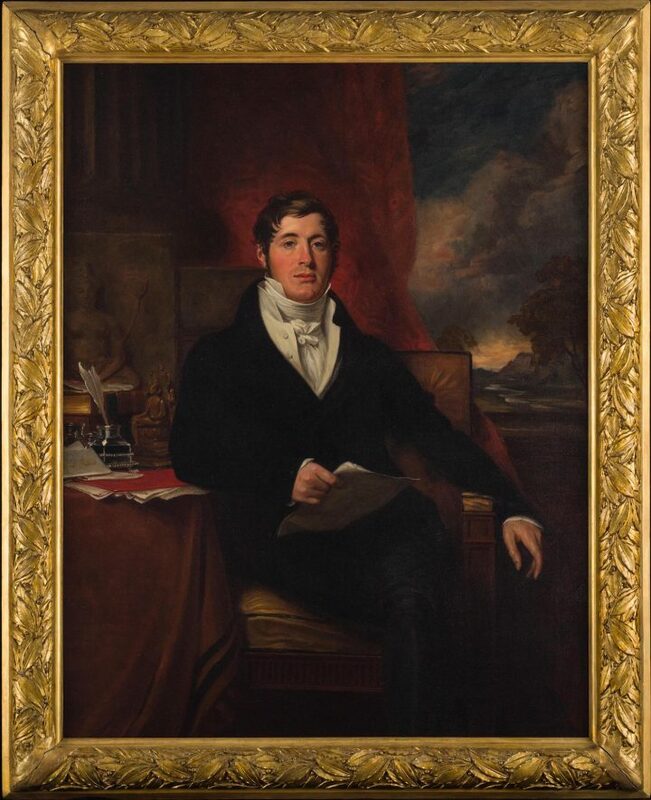 Sir Thomas Stamford Bingley Raffles was born on a ship in the Caribbean in 1781, to a merchant father who had gotten his family into progressively worse debts while trading in the West Indies during the American Revolution. Faced with abject poverty, Raffles left school and started work as a clerk at the East India Company at 14. With due diligence and a notable talent for brown-nosing, he ascended the ranks and assumed the post of Lieutenant Governor of Java by age 30, and was widely credited with founding the port city of Singapore when he was 38. After his authorship of the monograph The History of Java, Raffles was knighted in 1817. The rest is not so much history as some of the best copywriting in existence, thanks to colonial marketing and Singapore’s own historical revisionism. This all may sound innocuous, until one takes a closer look and realizes that, as the leader of the British invasion of Dutch-held Java, Raffles was responsible for the deaths of thousands. At one point, he authorized the enslavement of hundreds of men and women at Banjarmasin (modern day Borneo) for a failed colony. All of this goes unmentioned in the exhibition, the contents of which are presented in no particular order. There are precious manuscripts, looted from the royal palaces of Java as war booty; tourist trinkets made to satisfy Orientalist fascination with Hindu-Buddhist artifacts; and plenty of Javanese theatrical objects and instruments, many of which belonged to incomplete sets because they were acquired by Raffles on account of their exoticism. While it goes without a doubt that Raffles’ significance as a colonial agent should be a defining factor in his characterization in historical discourse, and thus how contemporary understandings of his actions should be renegotiated, it is surprising that his scholarship is what receives the harshest scrutiny in this exhibition. Instead of focusing on Raffles’ acts of destruction, it examines his penchant for plagiarism and spicing up his manuscripts for the audience back home. 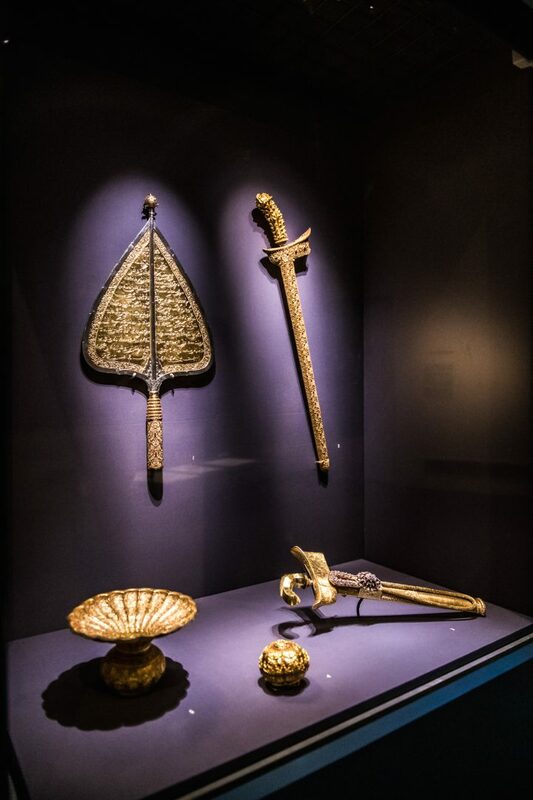 Items of the royal regalia of the Johor-Riau-Lingga Sultanate. While the exhibition’s efforts to combat Raffles’ distribution of misinformation are scintillating at times, the colonizer’s tendency to embellish is a mere footnote to the bigger story that is largely ignored here: the deep gouges that the East India Company left in Southeast Asia’s regional history, the bloodshed, and, most importantly, the locals who remain voiceless and unrepresented, even in an exhibition ostensibly about their histories. We see Southeast Asia through Raffles’ eyes, as a land for lining the imperial coffer — the entire show is about what he collected, what he wrote, what he commissioned — but we never get to witness Southeast Asia as itself, a region that’s home to one of the world’s largest populations, a region preoccupied with responding to invaders and its own shifting geopolitics in the age of empires. Indeed, the exhibition’s parting shot was how tragic it is for a ship that carried the bulk of Raffles’ collection of Southeast Asian manuscripts to burn down, thus depriving us of valuable knowledge, without taking into consideration the loss that has been inflicted on the cultures from which these books were taken, often forcibly. 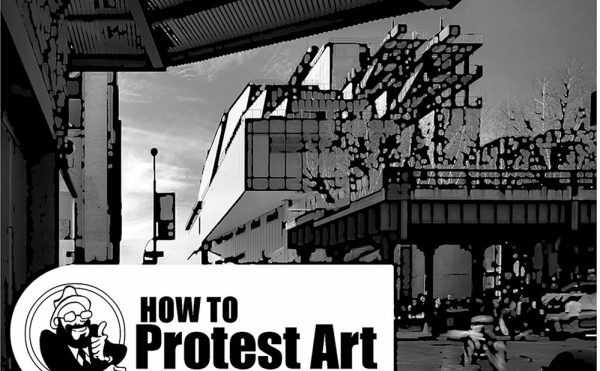 It is precisely this sort of milquetoast moral myopia that irks a conscientious visitor: yes, we have revisited the scholar and statesman, but so what? We have come out no better than before we went in — we have merely retread familiar grounds masquerading as new, finding occasional nuggets of anodyne insight. Reading between the lines at Raffles in Southeast Asia does not work, because there are barely any lines there in the first place. 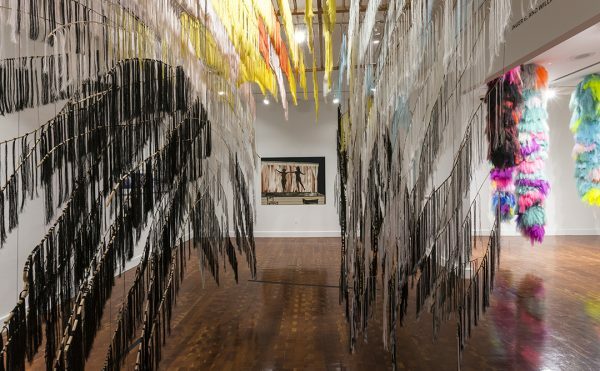 Despite the museum’s supposed intention to start a new conversation on the continuing legacy of colonialism, it barely provides an introduction to such a conversation, because it distracts from a colonizer’s major evils by drawing our focus to his milder misdeeds. There is still so much to be said. 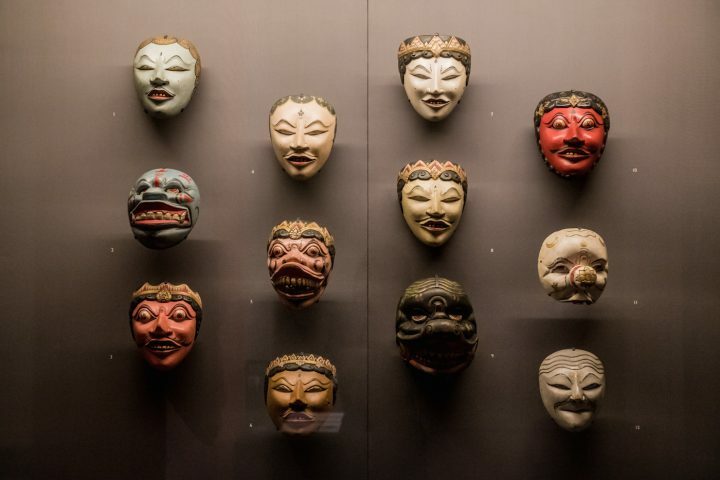 Sir Thomas Raffles’ mask collection. Raffles in Southeast Asia: Revisiting the Scholar and Statesman is on view at Asian Civilisations Museum through April 28, 2019. The exhibition is curated by Stephen Murphy and Naomi Wang from Asian Civilisations Museum, and Alexandra Green from the British Museum. Correction: A previous version of this article stated that Sir Thomas Stamford Bingley Raffles’s father had traded in the West Indies during the American Civil War; this is incorrect, it was during the American Revolution. We apologize for the error and it has been fixed.